Singer says: “Hippies are coming back to OB.” Video at end of article. There has been a renewed interest I’ve seen among current OBceans about the history of Ocean Beach – particularly the period during the late 1960s when OB became the Haight-Ashbury of San Diego. Part of this interest, I think, stems from a renewal of grassroots activism in our seaside village. Whether around saving Torrey Pines, blocking illegal development projects – or opposing a Target Express moving onto Newport Avenue, this activism has rejuvenated a sense of “community” among locals. Motivated by the talk I was to present for the OB Library on “Hippies in OB” back in April of 2016, I tried to collect some of my better writings about Ocean Beach and its history into the following, published originally on April 27, 2016. By 1967 – a year after the OB Pier had officially opened – it was already evident that Ocean Beach was morphing into the San Diego equivalent of that fabled and iconic San Francisco neighborhood synonymous with “hippie-ism”. If you were a hippie or a hippie-wannabe during this time somewhere in San Diego, you ended up in OB. Along with young sailors and other younger working-class people – predominately white – youth had become a sizable segment of the citizens of the neighborhood. And when the youth sub-culture developed during the Sixties in music, art, styles, drugs of choice, clothing, hair-cuts or lack of, language and politics, OB was right there, on the cutting-edge. Now, the counter-culture did not grow in a vacuum. Something was driving it – something that swept through the sea of young people becoming more and more disenchanted and disengaged from the mainstream culture and politics. Over just a few years, it seemed an entire generation of American young people were rejecting the values and customs of mainstream culture. Youth on a broad scale were reacting to the very uptight society they were growing up in, a society they perceived – and rightly so – as being beset with greed, war, racism, gross consumerism – and a hundred other ailments. It was also the music – the Golden Era of Rock and Roll had ushered in a certain new wave of exhilarating and liberating sounds. And attitudes toward traditions were rocked – old ways fell by the wayside, as the youth culture took on more and more efforts to shock the screwed up sensibilities of the mainstream. For instance, during the war period of Vietnam, the wearing of military-style clothing by young people became fashionable. People wore military jackets not only to look cool but to mock the militarization of America. Marijuana – and other drugs – were part of it. Use by local teenagers of the intoxicating weed changed abruptly between the years 1966 and 1967. Very few businesses catered to the young. OB did have its first head shop on Newport – the Paisley Pelican, which evolved into The Black, and there was the Inbetween – a drop-in center on Newport – but there were no coffee houses, no organic veggie stores or restaurants, no juice bars, no music or dance clubs, and many of the bars that existed catered to an older crowd. Unlike the current downtown OB scene any evening of the week, there was virtually no night-life on Newport Avenue. It wasn’t easy being a hippie in those early times. It is perhaps difficult to understand what it was like to be a hippie, forty years after their initial appearance on the American cultural and political landscape. The hippies, the peaceful warriors of the counter-culture were seen as a threat to the mainstream culture and its values. The system – the establishment – reacted very negatively when young men and women in massive numbers discovered and asserted themselves in the new hip ways, with dress, hairstyles, and language. A whole array of institutional forces slammed down on the hipsters, starting with mainstream media which flooded the news and airways with negative stories about ‘bad, dirty hippies’. Other pressures also existed, from police harassment, to landlord abuse, institutional and bureaucratic blocks, and business prejudice. It was cultural suppression. A cultural war. This war of the cultures was played out in places like Ocean Beach, where hippies lived. After the 1968 wide-spread flowering of the hip generation, housing inspectors swept through the beach community, citing landlords for poor housing conditions. But the effect was to have condemnation proceedings used to rid OB of its worst slums – knocking out housing that hippies and young people could afford. Many straight businesses showed their prejudice against the hippies unabashedly. Long-hair on men was abhorrent, they had to be dirty. Hippie women were loose and promiscuous. Officialdom in Ocean Beach shunned the hippies. Newport merchants eyed them with a deep, animal-like suspicion whenever a young person perceived as a hippie entered their store. It was likely the merchants who pressured city officials and the police to do something about these hippies. In the cultural war, police officers were forced to be on the front lines. Police harassment of hippies – whether in OB or across the country – has been well documented. At the time, it was a standard practice of police officers to stop whomever they wished and run a “Field Interrogation” on them. This was used constantly on young hippies (and African-Americans, Mexican-Americans). The prevalence of the hippie – youth tension with cops was clearly evident in the results of the Spring 1971 OB Study of a White Youth Ghetto (see “New Blood”). The survey, home interviews of 741 residents of north-west OB, found a generally negative view of San Diego Police. 40% of those contacted considered police harassment to be one of the most disagreeable factors in living in OB.71% of those between the ages of 15 – 18 expressed this view. More than one out of every three people interviewed had experienced some form of adverse contact with the police in OB. Nearly 40% of the 15 to 18 year group reported being field interrogated themselves. Finally, approximately 56% interviewed favored community control of the police. This tension between the community’s youth and the local gendarmes, clearly obvious in outbursts such as the Easter Riots (1968), the Jetty battle (1970), and the Collier Park Riot (1971), would fester until action was taken by the local town council in conjunction with activists who collaborated on efforts to curtail outrageous police conduct. Persecuted by the institutions, the police, landlords, hippies were under siege but bursting out all over everywhere– all at the same time. They couldn’t be stopped. And hippies congregated with other hippies, especially in Ocean Beach. 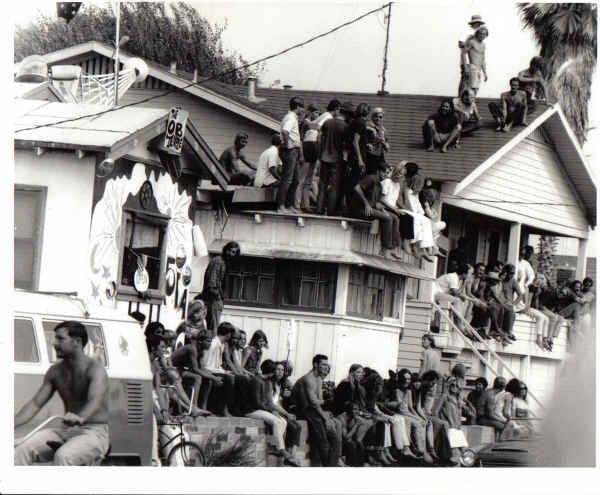 By the early-Seventies, hippies in OB were becoming more accepted. Many of the more active counter-culture activists began creating progressive projects in OB, and who built alternative institutions to the moribund mainstream institutions. An OB free school was developed; a legal aid office on Voltaire was opened for awhile; the organic food co-op went from a backyard shack to a storefront on Voltaire; OB Ecology Action became a mainstay in the community for years; and the OB Rag experienced a whole new crop of talented grassroots journalists. Over the next few years, the forerunner to the OB Planning Board formed – the OB Community Planning Group. A civil rights group – the OB Human Rights Committee – exploded into being over night in response to police harassment – which eventually led to reforms in police practices. A women’s group WAR formed in response to high incidence of rapes in the community. OB People’s Food Store on Voltaire. So, with time ecological and environmental interests and concerns among OBceans remained a major political force in Ocean Beach. The “green-ness” of OB was crystallized. To this day, OB has been known for this strong current of ecological fervor and grounding. Over the next several years, this was translated into a momentous anti-development movement among residents and businesses that led to the “re-writing” of the OB Precise Plan and the destruction of plans for any local “Miami Beach”. The early Seventies also re-affirmed OB as an ‘anti-authority’ and anti-establishment community, and as the center of hippie culture in San Diego, the anti-pole to a staunchly conservative town that Richard Nixon called his “lucky city.” Perhaps it was because of the staunch conservatism that ranged supreme since World War II in San Diego, there had to be an anti-pole, and our beach neighborhood took the job. But on every cultural and social level – art, music, social nuances that found expression here, and on political levels from urban planning to environmentalism to a disdain for military empire, this island, this beachhead – or whatever analogy you want to use – became the antithesis to a white-dominated reaction that has held this part of the country since the Fifties. And it was the hippies – and their bohemian brethren before them – that was the basis for all of this. Ocean Beach became recognized as the capital of the counter-culture – and it still is even today. OB became the symbol of a community resisting the mainstream culture and politics, with its conflicting aspects such as its “laid-back” characterization juxtaposed with its “in your face” reputation. Mainstream media loves to laud OB this way, and every now and then, the local press will publish fluff pieces about OB. 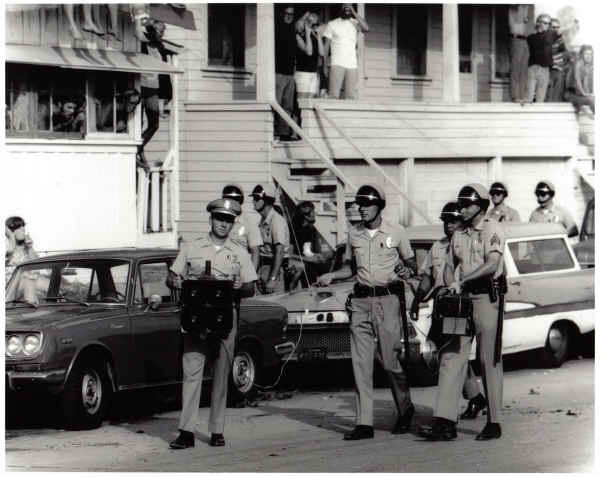 Long Branch Avenue, police action, Labor Day 1968. In fact, for the last half century, Ocean Beach has been in the forefront of most social and political issues confronting the country. It has been an island of liberalism in a San Diego sea of conservatism. It has been a beachhead of progressive ideas and practices. It is a community tolerant of different lifestyles, sophisticated culturally, with a tradition of housing rebels with causes. Along with the hippies, came an appreciation for healthier lifestyles and ways of living. Organic food, vegetarianism, non-synthetic clothing, the calming some achieved from “Eastern” religions and philosophies, a critique of Western medicine, finding “balance” in de-stressed living, – were all part of this toleration for the unusual that our community developed. 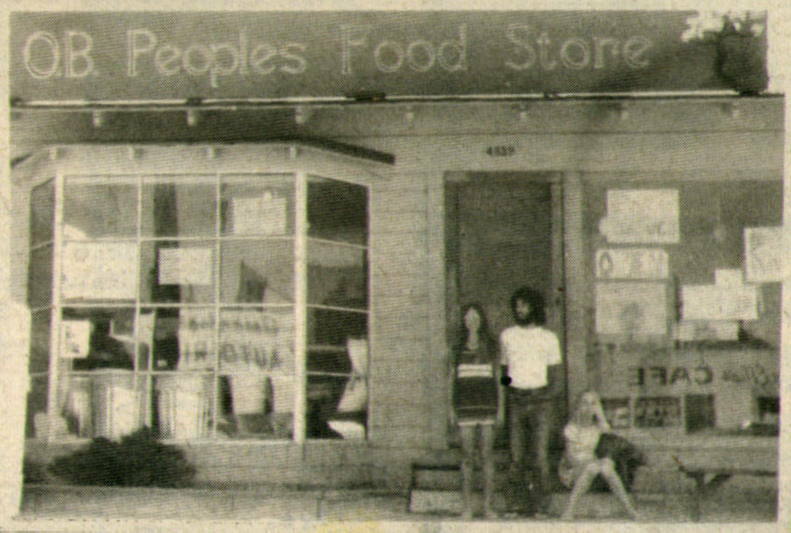 What later became People’s Food Co-op saw its birth during the early Seventies, as people clamored for better, healthier and cheaper basic foods. If anything, OB has provided – at least since the Sixties – cultural space for alternative lifestyles that went against the grain of the establishment, of the “straight” world; lifestyles that were able to hold off over-zealous urban development, that provided an incubator for ecological awareness, and that demonstrated to the rest of the County a remarkable awareness of the changes that the general society was going through. Bottom line, while much of Southern California developed into a myriad puzzle of suburban sprawl, crisscrossed by freeways, constrained by an automobile-centered way of life, and a deeply-set middle-class alienation, during that same time, OB became a village. And it still is today. Newer Article: Do You Want This Ocean Beach House for Free? Come and Get It!